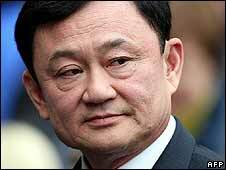 Ousted Thai Prime Minister Thaksin Shinawatra has said he will not return to Thailand from the UK. In a statement released to the Thai media, Mr Thaksin said he and his wife would remain in the UK, "where democracy is more important". Mr Thaksin is on bail over corruption charges but failed to make a scheduled Bangkok court appearance on Monday. Thailand's Supreme Court has now issued an arrest warrant for the billionaire, who owns Manchester City football club. Mr Thaksin says the charges are politically motivated and an attempt to remove him from politics. The former leader had been due to return to the Thai capital on Sunday after a court allowed him to attend the Olympic Games opening in Beijing. He and his wife - who is on bail pending an appeal after she was jailed for three years for tax fraud - were to appear before the Supreme Court in a case involving the allegedly unlawful purchase of land. Instead Mr Thaksin issued a statement announcing his decision not to return home. "What happened to me and my family and my close relations resulted from efforts to get rid of me from politics," he said in the hand-written statement. "These are my political enemies. They don't care about the rule of law, facts or internationally recognised due process." Mr Thaksin apologised to the Thai people for his decision to live in the UK, where his daughter is attending university and where he owns several properties, as well as the Manchester City football club. "If I am fortunate enough, I will return and die on Thai soil, just like other Thais," he said. Observers have said that the former prime minister may attempt to claim political asylum in the UK, but there was no reference to this in the statement. Thailand's Supreme Court reacted swiftly. "The court sees that the defendants have broken their bail terms. Therefore, it issues an arrest warrant and orders their bail bonds to be seized," a statement said. The court had agreed to try several cases against Thaksin Shinawatra for allegedly abusing his power while in office. Mr Thaksin was the first Thai prime minister to serve a full five-year term. He was extremely popular in rural areas but far less so amongst the Bangkok elite. In September 2006 the military removed him from power, accusing him of corruption. Military-backed investigators began probing allegations against him. But then Mr Thaksin's allies won power in the first post-coup polls. The former leader returned to Thailand in February. He said he had no plans to return to politics but his opponents did not appear to believe him. Political wrangling between the two sides intensified and anti-government street protests resumed in the Thai capital. Prime Minister Samak Sundaravej was accused of acting as a proxy for Mr Thaksin and faced calls to step down. In the meantime the courts - newly empowered by the military-backed constitution - continued to pursue various cases against Mr Thaksin and his family. Last month, in an unexpected move, the former prime minister's wife was jailed for tax fraud. The ruling will both have shocked Mr Thaksin and served as a powerful indication of what could lie in store for him at the hands of the courts, analysts say, hence his decision to remain in the UK.